Jungle Red Writers: DON'T Forget this! And one of my current favorite favorite books was written by a favorite favorite author, the brilliant Jessica Strawser. I truly don’t know how she does it—writer, editor, mom, wife and all around amazing woman. It’s called Forget You Know Me, and it begins with a video chat. Think about that. What might the other person see happening in your life—that they’re not supposed to see? I ask you—is that a brilliant idea or what? Jessica’s on book tour of course, but she and I chatted before her whirlwind began. But she’ll pop in today of course, and maybe we can get her to tell the story of the person who emailed her about her hair. HANK: Welcome, Jessica! I completely LOVED the opening premise. (In fact, let me admit, I was grumpy with myself for not having thought of it.) Plus it was so realistic and so plausible—did something like that really happen to you? JESSICA STRAWSER: When the idea for this book came to me, it was ONLY that opening scene (and not from real life, thank goodness, but from the mysterious ether of my overactive imagination). Typically my stories grow from a central question or theme I've been mulling over for a long time—years—and I then debate where exactly the pages should begin. It was quite different to start from such a vivid picture, from such a specific point at time, so much so that I resisted at first. But the idea grabbed me and would not let go, I think because of exactly the lure you mentioned: 10 different writers could start with that scene and write 10 very different stories of what happens next. And I'd like to read them all. HANK: Oh, that's a great idea. (Should we edit an anthology, hmmm?) (Seriously.) (It's a good idea.) (In our spare time.) I know we don't want any spoilers, but tell us a bit about your book! JESSICA STRAWSER: Yes! Look for the sequel, No Seriously Really Forget You Know Me This Time, just as soon as we uncover this mysterious “spare time” of which you speak! The story opens when two long-distance best friends, Molly and Liza, are trying to reconnect over a video chat, and the webcam captures a heart-stopping moment no one was meant to see. Liza jumps into action, willing to do anything to help her friend—but is hurt when Molly’s response is icy, raising more questions than answers. Through the alternating perspectives of Liza, Molly, and Molly’s husband, Daniel, we’ll soon learn the secrets that have been driving them all apart. But whose confessions hold the answer to what really happened that night? And—at the heart of it all—when a friendship or a marriage gets this close to the brink, can anything pull it back? In the next “masterful” (Publishers Weekly) novel from "the gifted Jessica Strawser" (Adriana Trigiani)--a video call between friends captures a shocking incident no one was supposed to see. HANK: Ooh, right? Jessica, there's a thread of "best friends" in the book--how much do you think "best friends" matter in our lives, and why was that interesting to you? Adult friendships are so—complicated. JESSICA STRAWSER: I’m reaching a stage of middle life, I suppose, where I find myself observing how drastically friendships can change over time—sometimes through nothing more than circumstance—but also how important they are, in spite of the fact that we sometimes give them a backseat to spouses and children and the general busy-ness of life. I’ve written about close friends in all of my novels—I like to think of characters in terms of their relationships, and friendships are particularly interesting because they can be so influential but also so malleable. In this one I wanted to follow not just friends but also spouses who have a lot of history, a lot of love, but aside from that haven’t been very honest with each other, or themselves, about what’s going on in their minds—enough that they’ve broken the tight seal of that bond. I know a lot of people grappling with that sort of gray area, wondering whether they can reverse a relationship that’s falling apart. It was fun to give these characters something that forces them to stop brushing things under the rug and confront each other, for better or worse. HANK: Not giving it away--but did you know the ending before you started? How do you want your readers to feel? JESSICA STRAWSER: I knew the very basic ending but not how I would get there, or—key in this particular novel—what it would feel like when I did. I’m always leery to say how I want readers to feel (it’s up to them, not me!). But I do like stories that leave me thinking about them hours and days after I’ve turned the last page, so it’s always a compliment to hear I’ve achieved that. HANK: So, Reds and readers, are you as enthralled with this kind of book as I am? I love that these conflict happen to real people, in real situations, that the stories are riveting and chilling—but entirely plausible. How well do we know the people around us? Do you read domestic suspense? (Or what do you call it?) Tell us your favorites—it’d be great to have some reading suggestions! And a copy of FORGET YOU KNOW ME to one lucky commenter! (jessicastrawser.com) is editor-at-large at Writer’s Digest, where she was editorial director for nearly a decade. She’s the author of the book club favorites Almost Missed You and Not That I Could Tell, a 2018 Book of the Month selection and Barnes & Noble Best New Fiction pick. 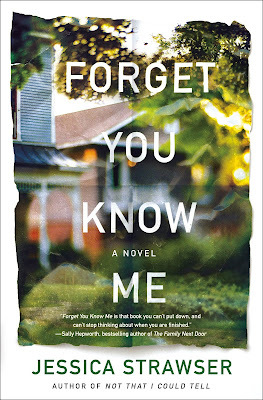 Her third novel, Forget You Know Me, is out this week from St. Martin’s Press. She has written for The New York Times Modern Love, Publishers Weekly and other fine venues, and is a popular speaker at writing conferences. 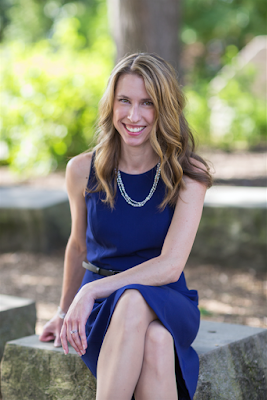 She lives with her husband and two children in Cincinnati, where she is currently serving as the 2019 Writer-in-Residence for the Public Library of Cincinnati and Hamilton County. Connect with her on Twitter @jessicastrawser, Facebook @jessicastrawserauthor and Instagram at @jessicastrawserauthor. Congratulations on your new book, Jessica. The story sounds quite intriguing and I’m really looking forward to reading the book. I’m not certain that I like the term “domestic suspense,” but I do enjoy those stories with twisty plots and unforeseen reveals that take the reader to an unexpected place. I recently read and enjoyed Annie Ward’s “Beautiful Bad” . . . . Thank you, Joan! This one was a lot of fun because it took its author to an unexpected place as well. Adding Beautiful Bad to my list—thanks for the recommendation! Color me very intrigued. I am definitely going to have to check this book out. Oh, terrific. Yes, what a great premise, right? Thanks so much, Mark! I hope you'll enjoy it. This book sounds fabulous! And yes, I read domestic suspense. One I enjoyed was Carla Buckley's The Good Goodbye. It was a book I first heard about through JRW, actually! Fabulous premise, indeed! Of course I read domestic suspense (and I'm fine with the term) - I snap up Hallie's new books the minute I can, for example. If I ever branch out from writing cozy and historical, that's the direction I want to head. Congratulations, Jessica! I'm looking forward to this read. Great- and of course Hallie‘s books are sn instant buy. Thank you so much! You are SO prolific—I have no doubt you could shift successfully any way you choose. I hope you'll enjoy the read. Oh, sounds excellent. Not sure how I feel about the term domestic suspense, I'm leery of parsing down categories of books any further than we already have. Let's just call this a book that will have your attention from page one and let it go at that. Looking forward to an exciting read. Thank you, Kait! I agree that categorizing books is much more the stuff of publishers, bookstores, and to some extent readers. We write what we feel compelled to write! So glad I've piqued your interest, and hope you enjoy the read. Yes, yes, to domestic suspense. But not a steady diet of nothing else. I find it too intense, and have to intersperse with lighter reading. My 89-year old mother, though, is a much bigger fan of that genre, go figure. I will, Hank. She'll get a big kick out of that, since she's a big fan of yours. Hi, Karen! Love my Cincinnati readers (and this book is set here—you'll recognize some settings, I think, including Cincinnati Nature Center and Lunken Airport). I'm going to be at Jo-Beth in Rookwood tonight, in fact—maybe I'll see you! I think this one will be up your alley as it's a true hybrid between suspense and women's fiction—with real focus on the characters and not relentless intensity. Love that your mother is still reading at 89! Always enjoyed a good book talk with my mom. Jessica, my father-in-law was instrumental in getting the Nature Center started. It was his idea, and he put the Rowes and the Krippendorfs together! It would be fun to see you. Oh my gosh, small world! Such gratitude for your father-in-law's work. The library there is one of my favorite places to write. Welcome to JRW's Jessica; I just reserved Forget you Know Me, sounds great!. Which is more fun for you, editing or writing? Hallie's oeurve is the first thing that came to mind. Until just now, I didn't know the name of this sub genre; Domestic Suspense -- who knew? "I let you go". There you go, 5 more titles for the group. I haven’t read “My Sister..” yet, but I think I have read the others! I Let You Go was terrific… The twist totally got me! Evendale, Ohio checking in. Looking forward to your library writer's workshops and your new release. Oh fun! Sounds like jessica will have a big jungle red contingency! okay, I'm hooked! No matter what you are calling it, this sounds fantastic! It will probably make me anxious and I won't be able to put it down. That's not a bad thing, is it? Great indeed! I love getting those messages from people bemoaning that one of my books kept them up all night, and responding with a classic #sorrynotsorry. ;) Thanks for reading! It's always fascinating to hear where the story came from. And I am hooked. This is a book I have to read. A good read on the topic is Sarah Weinman's TROUBLED DAUGHTERS, TWISTED WIVES an anthology of stories from "trailblazers of domestic suspense." (Patricia Highsmith, Nedra Tyre Shirley Jackson, Margaret Millar, Minette Walters...) Also a fabulous short story anthology from awhile back edited by Elizabeth George, A MOMENT ON THE EDGE: 100 YEARS OF CRIME STORIES BY WOMEN. For the Pennsylvanians who hang out at Jungle Red, Jessica will be this May's keynote speaker at the Pennwriters conference. Lots of good buzz already happening! Lucky everyone! What a fabulous convention, I adored my time at Pennwriters, and Jessica is a rockstar. Sounds fabulous! Oh, goodie! I will get to meet here there (as a Pennwriters virgin...). Yes, thank you, Ramona! Fun fact: This year's Pennwriters is in the town where I graduated from high school. My prom was in a different hotel just down the street--and I keep joking that I'm so excited to keynote, I might wear sequins again! ;) Looking forward to meeting you & Edith & all the rest. First of all, Jessica's new book has been on my list since last fall. I read and really enjoyed her two previous books, NOT THAT I COULD TELL and ALMOST MISSED YOU. So, this one was automatically included in my long list of what comes next. I think the idea of someone seeing something unexpected and strange through a video chat is really intriguing...really. My mind goes to all kinds of places. OK, here's a funny thing - our mystery group actually had a video visit with Hank last night - they loved it, by the way, Hank - and during the talk one member asked about Hank's awards and she turned the camera so that we could see higher on her shelves. My mind says...what if????? Ha! Definitely not wishing Hank anything bad, but...ha! And could I add TRUST ME into this type of book - my term for them is 'psycho thriller'. Jessica, hope you have a great tour and I'll be reading this new book very, very soon! Oh, forgot to say that I think the idea of an anthology with that premise would be brilliant. Especially since I saw an article just this morning that said that Skype will now have an option to blur the scene behind the person. Timely, huh? We had such a good time--what a terrific group! And yes, that's so meta, discussing FYKM via video. Oooh. And you are so right , Kay--what might you have seen in the background? Jessica, welcome to Jungle Reds! This sounds like something straight out of the Twilight Zone! And very mysterious. Congratulations on your book birthday! Twilight Zone--because it is so POSSIBLE, right? And then it turns out to be something else. Love that! I'm laughing at myself. As I read through the posts from everyone I was trying to remember the author of a really good title I finished last month. I grabbed my Kindle, scrolled through"my library" and there it was! "Not That I Could Tell" by... Jessica Strawser. So, yes I enjoy this genre and yes, I apparently LOVE Jessica Strawer. I always read anything by Hallie and Hank. Well,come to that, I read anything any of the Reds have written, to the exclusion of shopping lists. Although, now I'm curious. What does a shopping list or a "to do list" from one of the Reds look like? Oh, my to do list is hilarious! It's in a notebook--we'll have to do a blog on that someday! Welcome Jessica. Your premise intrigues me, and I'll certainly check out your book. I'm not sure what domestic suspense is exactly. (I guess I know what it isn't: THE GIRL WITH THE DRAGON TATTOO.) I really dislike the sub-genre notion, since I think anything I choose to read is literary, period. I wouldn't classify Larry McMurtry as "cowboy" fiction for instance. We had an event in the neighborhood a couple of years ago, and I wish one of you would develop this into a book. Sadly, a woman up the street hanged herself in the garage. This was bad enough, but it seems her husband's first wife had done the same, different garage. Either this was a big F you moment from wife #2 or that husband has little imagination. Thank you, Ann! I think more than a subgenre, my titles are cross-genre, with strong elements of suspense but also women's fiction (another term I dislike, if I'm honest, but what can you do). Fascinating, horrible story about the woman in the garage. It reminds me of something... Maybe a little bit of THE GIRL BEFORE by J.P. Delaney? Common denominator there is not a husband, but a landlord. YIKES. Not a coincidence, but fascinating, in a crime fiction sort of way, to realize how many explanations of that there might be. Yeesh. Domestic suspense is a term that suits many of the novels written lately. I just called these books thrillers and mysteries. Your story sounds thrilling and intriguing. What a great plot. Thanks so much! I do hope you'll enjoy it. Yes, but "domestic suspense" tells you a bit more, right? This book sounds gripping. I've loved domestic suspense, starting with Daphne Du Maurier. I'll be looking this one up! Welcome Jessica. I have read your memorable novels and look forward to enjoying your new release. Gripping and intense. I have read several books in this vein which are riveting. some are hard to take and others fascinating. Freefall by Jessica Barry was captivating. Her One Mistake. "Memorable" is such kind praise. Thank you, truly! Her One Mistake is on my list ... appreciate the nudge to bump it up the queue! I've been hearing a lot about Freefall! I can't say that I have read domestic suspense but I have read more books summaries lately that could qualify. Your story sounds intriguing to me. Count me in the group that is iffy on the term "domestic suspense," but I lap up those kind of books with abandon. I've read most of Hallie's and I'm sure this one would be quite an enjoyable read. But like Karen in Ohio, I can't read nothing but domestic suspense. My psyche needs a breather once in a while. But domestic suspense almost has to include women' fiction elements, doesn't it? Because it's about relationships.. But then, women's fiction is also a complicated label. Friendship is such a strong theme for me (I travel through life in one squad or another) so I am absolutely, one hundred percent hooked! Can't wait to read the book, Jessica! Which destroys any illusion of spare time I might have had. LOL! Thanks, Jenn! After all, who needs spare time when we have books? ;) Appreciate you reading, and hope you enjoy! FORGET YOU KNOW ME sounds irresistible, Jessica. And yes, I've really been enjoying the spate of domestic suspense-psychological thrillers that have been having such a big moment in publishing. So many times, books BY women ABOUT women's experiences are kind of shoved to the side when it comes to critical acclaim or attention - I'm delighted to see this genre is both successful and being taken seriously. An important perspective, Julia! Thank you for adding that to the discussion. Well, I am completely intrigued by Forget You Know Me. I have gotten quite a taste for what Hank describes as "Grip lit, Domestic suspense, Suburban noir, or Psychological suspense." The authors I've read who write it are brilliant at the twists and turns and deceptions in it. Hallie and Hank, you both rock it. And, it's bringing new authors (new to me) to my attention, like my recent read of Lisa Jewell's Watching You. Now, I'm delighted to have another author to add to the list, as, Jessica, Forget You Know Me is definitely a must-read for me. This is one friendship I can't wait to follow through its twists and turns and secrets. Jessica, I see that you live in Cincinnati. My hometown is Maysville, KY, right down the Ohio River from you, and Cincinnati played a big part in my growing up years. In fact, my pediatrician, Dr. Wagner, was in Cincinnati, and I bought my wedding dress there. We used to shop there during Christmas and delight in the Shillito's Christmas windows. I try to get back to Maysville and visit at least a few times a year. I still have lots of family and friends there I enjoy spending time with. In that case, Hi, Neighbor! You'll be happy to hear that Forget You Know Me is set here in Cincinnati, too! Lots of scenes set in some of my own favorite places, including Cincinnati Nature Center and Lunken Airport. (I have an earlier novel, Almost Missed You, that was set partially here as well.) Always love connecting with local readers -- thanks so much for taking the time to comment. Shillito's! I have not thought about that for YEARS! I went to college in Oxford Ohio--and that is a familiar name. Aw. Shalom Reds and fans. I just put this book on my TBR list yesterday. I tried to look back and see how the book came to my attention but had no luck. I am on Jessica’s mailing list and I’ve saved at least two of those emails in the last two years. So I guess we’ll bump one of these books to the top of my lists. I did find one email from a while back that included one of your books under the “genre” of Marriage Thrillers. Another email contained your essay which I read about the “unwitting bystander”. I suppose the grand-daddy of all in this genre in the modern era is the movie Gaslight with Charles Boyer and Ingrid Bergman. I had no trouble watching this as a teenager but now as a senior adult, I can only watch because I know the end. I still have difficulty watching Shakespeare’s Othello. It all cuts a little too close to home. All that said, I will look around for a copy of Forget You Know Me either at the bookstore or on Amazon’s Kindle. Thanks so much for your interest, David! I barely ever send to my mailing list, so if you have two from the last two years, it's possible you saved them all! ;) (I like that batting average.) Funny you mention Gaslight because I've used it as a verb more than a couple times in describing Molly's initial front to Liza in Forget You Know Me. Will be interesting to see what you think! A psychological suspense that starts with a video chat? Sounds like a great read to me. I can't wait to check it out. Hank, thank you so much for Skyping with our mystery book club last night. It was such a privilege to chat with you. I loved it. Kay sent me! You mentioned that not many people leave comments, and I've been reading the blog since Kay introduced it to me. So I'll make an effort to comment more. Oh, Casey, it was so great and such fun. And the questions were perfect. . What a treat to "meet" you all! And I am so impressed that your book club has been together for eleven years. That is inspirational! And we adore hearing from you. We know there are non-commenters out there, so maybe you can be their inspiration, too! Thanks, Casey! And your group was so lucky to have Hank via Skype. She's the bee's knees! Hi Jessica! I love Hank's term, "grip lit." So much closer to the heart of it than "domestic suspense!" And I absolutely love your premise! It made me the think about the recent Face Time bug, where someone on one end can still hear the conversation on the other, even after the call's been ended. Also, like Jenn, I'm very interested in women's friendships, so this is definitely going on my list. I love "grip lit" too, Deborah—first time I've ever heard it, and I may just steal it. (Hank is brilliant that way.) Happy to have piqued your interest, and I hope you'll enjoy the read! Ha -- saw this just after I responded to your comment above! It has legs, ladies. Checking in late; I got dragged to an RV show. Yawn. I do like suspense! And I want to know what Liza saw when Molly was out of the room. I can't dredge anything up shocking enough. Hints? Yes, I like suspense in the story line! I find myself being drawn to it more and more! Putting Forget You Know Me on by TBR list. And speaking of video chats, I was also with the group Wednesday night. (I was the one that read Trust Me and was kinda creeped out) So fun. Thanks for your time. Forget You Know Me sounds like a book I will like.